An analysis of the investment approach of the world's top investors, showing how to achieve market-beating returns. It is possible to beat the market. 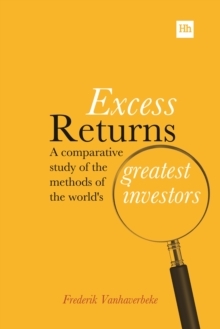 Taking this as a starting point, Excess Returns sets out to explore how exactly the most famous investors in the world have done it, year after year, sometimes by huge margins. Excess Returns is not a superficial survey of what investors have said about what they do. Rather, Frederik Vanhaverbeke applies a forensic analysis to hundreds of books, articles, letters and speeches made by dozens of top investors over the last century and synthesises his findings into a definitive blueprint of how exactly these investment legends have gone about their work. Among the legends whose work has been studied are Warren Buffett, Benjamin Graham, Anthony Bolton, Peter Lynch, Charles Munger, Joel Greenblatt, Seth Klarman, David Einhorn, Daniel Loeb, Lou Simpson, Prem Watsa and many more.Among the revealing insights, you will learn of the striking similarities in the craft of great investors, crucial subtleties in their methods that are ignored by many, and the unconscious errors investors commonly make and how these are counter to successful investing. Special attention is given to two often overlooked areas: effective investment philosophy and investment intelligence. The investing essentials covered include: finding bargain shares; making a quantitative and qualitative business analysis; valuation methods; investing throughout the business cycle; timing buy and sell decisions; and much, much more! 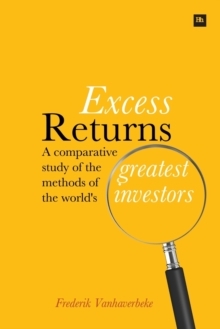 Excess Returns is full of timeless and practical insights, presented in a unique style, to help investors focus on the most promising opportunities and lead the way to beating the market.